Francis Mary Croese, baptized John Evangelist, was born in 1804. 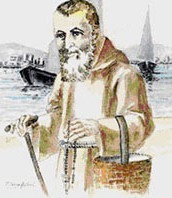 After entering the Order of Friars Minor Capuchin, he served for 40 years, beginning with begging for alms for the poor through the streets of Genoa. He zealously carried out his task of promoting the spiritual and temporal welfare of the people of Genoa. He acquired such a great reputation for sanctity that the Genoese called him “the holy father”. Francis had a special commitment to peacemaking. He sought to mend relationships among his friars, between families and even within individuals who were not at peace with themselves. This commitment was tested when he was struck by a rock and he picked it up and kissed it. By keeping his peace, he was able to pass it on to others, through his example. When cholera broke out in the year 1866, he offered himself as a victim for the sick and afflicted. He succumbed to the plague on September 17, 1866 and died that same year. With Francis Mary's passing, the number of cases of cholera immediately began to abate and the epidemic subsided. He was beatified by Pope Pius XI on June 30, 1929 and was canonized by Pope John XXIII on December 9, 1962. God, our Father, you made your servant Saint Francis Mary illustrious through every work of charity. Grant us through his prayer and example always to continue in sincere and humble service of our brothers and sister. We ask this through our Lord Jesus Christ, your Son, who lives and reigns with you and the Holy Spirit, one God, for ever and ever.